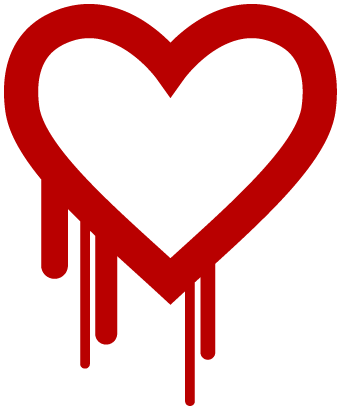 Unless you are living under a rock, you have heard all of the hysteria surrounding the Heartbleed openssl bug. Due to the nature of the bug and the possible exposure of SSL private keys, the openssl package needs to be updated and the SSL certificate needs to be regenerated. I will present the procedure that I used to patch a CentOS Linux server. Next I regenerated my SSL certificate. I needed to create a new private key and a CSR. I am leaving out the details that I used as they are different for each certificate. It’s important that you set the Common Name correctly. The Common Name is the Fully Qualified Domain Name (FQDN) for the certificate. If you are creating a wildcard certificate for foobar.com, then the Common Name is *.foobar.com. I now have two files in my directory, private-key.pem and csr.pem. Next I uploaded my CSR to my SSL certificate registrar. The exact details will be different between registrars. In my case, I used the User Portal for Geotrust. There was an option to Reissue Certificate. That opened a text box for me to copy and paste my CSR. 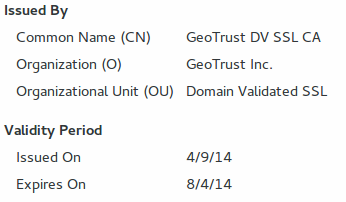 A few minutes later Geotrust sent me an email with the new certificate. I regenerated a certificate with Godaddy and the option was called Re-Key. Instead of emailing me the new certificate, Godaddy made it available for download from their website. Good luck and do not delay patching your systems. Please leave any comments or questions below.